Mama's Jewelry has been in business designing rings and pendants for moms for 30 years, and is always coming out with new designs to offer their customers. I love personalized Jewerly, it is one of my favorite pieces to receive and to give as a gift. As stated by Mama's Jewelry: A great deal of thought goes into the process of designing these rings, pendants and bracelets. They put their special touch on each piece they design for customers. The quality of the stones, the way they are set; no one gives the customer so much attention to detail. They have over 2100 positive reviews on eBay and thousands of reviews on Amazon and have sold tens of thousands of pieces without any complaint. Now this is a place I would love to shop knowing that they have sold so many pieces of customized jewerly with customers so satisfied with their purchase. There are so many great gift ideas offered for Mother's Day. I came across a few pendants that I think any mom or grandmother would love. They offer pendants for your children and grandchildren stones, and you can design your piece anyway you would like. You can have your pendants, rings made especially for you in sterling silver, rose gold, white gold and yellow gold. Design your options to which you like best. Here are some of my favorites. As soon as they receive your order they will send it out within 3 -5 days. A quick turn around time for those that are late shoppers like me !! 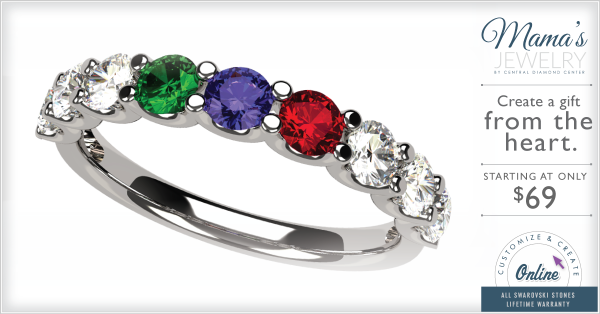 My mother in law has 12 grandchildren and I am thinking of ordering her the stackable rings. I would add 6 stones on each ring. She would love to have all her grandchildren's birthstones on her finger !! 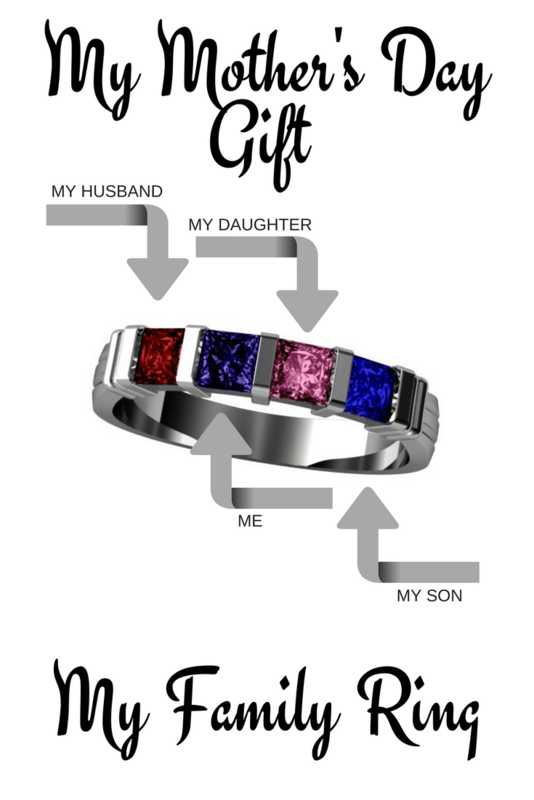 I would love a family ring I have always wanted a ring designed with both my children, husband and my birthstone. I would include my husband's birthstone, my birthstone and both my children's birthstone. I designed it quickly on Mama's Jewerly to see what it would look like. This would really be a special piece of jewerly for me. I am in love with my Mother's Day Ring. Instead of just my two children's birthstone I added our family. It is beautiful so happy with it. Keep in mind we as mothers are special and we do so much for our families. Even though we would be happy with just a card from our children for mother's day, why not send her a gift she will treasure forever. If you would like to personalize a piece of jewerly for Mother's Day, I recommend checking out Mama's Jewerly. I know you will find the perfect gift idea. This is a sponsored conversation written by me on behalf of Mama's Jewerly. The opinions and text are all mine.